Out here on the Internet, not all content is created equal. Some of it has legs, some of it doesn’t. Keeping this continuum of permanence in mind can help you stay in the right frame of mind when responding to a social media crisis. 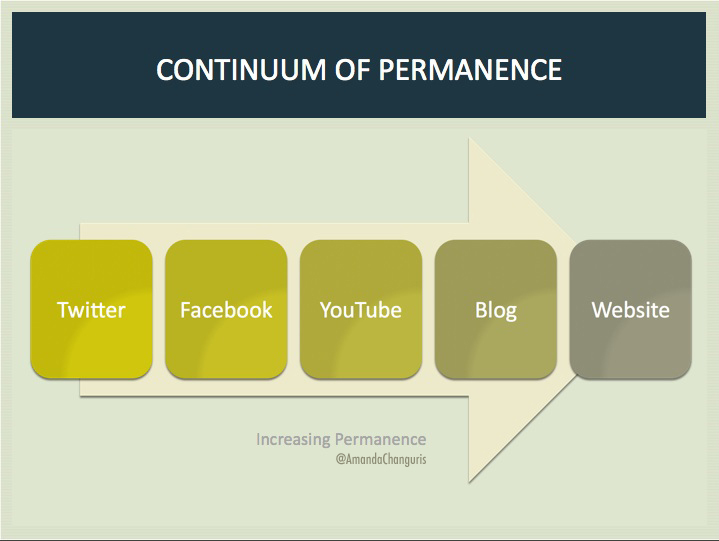 My theory of the Continuum of Permanence (as it relates to social content). Let’s start with Twitter. It’s all the way to the left of the scale because, by it’s very nature, its content is the least permanent. Tweets fly by in rapid succession (particularly if you follow a large number of users). It’s important to address critical tweets, but a single unflattering remark isn’t likely to ruin your business or reputation. Facebook is a little more permanent as compared to Twitter. There’s still a good amount of turnover (to the chagrin of many Facebook page managers), but the fire hose effect isn’t quite as strong. My policy is to respond to 99% of the posts on the Facebook pages I manage. Most of the posts are compliments, so it’s a fun part of the job. YouTube comments are more permanent than Facebook remarks because the comments stick with your video content. Whether it’s been five minutes or five years, that comment someone made about your video is going to be front and (nearly) center for anyone who watches it. In my experience, spam is the biggest issue on YouTube. The situation has improved over the years, but it’s best to keep a close eye on these comments since they live on well after the original post. Your blog is similar in permanence to YouTube, simply because comments stick with individual posts. Again, you’ll want to be sure the content that’s living as an extension of your blog post is relevant, useful, and that you’ve engaged with the person commenting as appropriate. Your website is the most permanent space you have. If you allow comments (we don’t, and I wouldn’t necessarily advise it, but to each his own) you’ll need to watch very closely and manage with care. I call this my Continuum of Permanence, but you could also call it my Continuum of Panic. I’m (slightly) less likely to need anxiety medication when someone posts a negative tweet than I am when they post something critical on Facebook and so on. What do you think? Where would you put Instagram on this continuum? Where do Pinterest or Google+ fall on the spectrum? More importantly: why?